Originally Western Road was a narrow trackway running through the West Laine from North Street to Hove Church. In the early nineteenth century a number of large houses were built with their gardens backing onto the road, terraces were known as Regent’s Place, Clarence Place and Western Place. By 1830 Western Road, which was named after the land-owning Western family, was developed as far as Montpelier Road and was the principal access to Brunswick Town. The development of high-class residential areas on either side, ensured the prosperity of Western Road. Many more shops were then built in the gardens of the large houses, and by the 1860s virtually the entire length was lined with shops. Click on the photographs to open a large version in a new window. 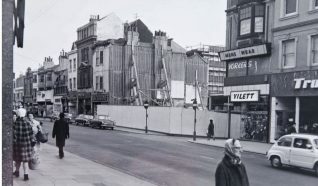 Photograph number one shows the start of the 1960s clearance of old shop properties at the extreme western end of Western Road, prior to the revealing of the vista of the new Churchill Square which had been in progress in the rear for some time. This photograph clearly shows how the one time separate houses of Western Road and Grenville Place had, over the years, been joined together to give greater depth to the ground floor shops. 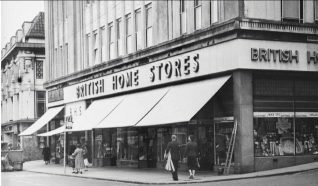 Photograph number two shows that this building was erected in 1931 and was occupied continuously from that year until 1969 by British Home Stores. When the stores moved to new premises in Churchill Square the building was reconstructed for occupation by C and A Modes whose store was opened in 1970. Photograph three shows a view at the end of Western Road, taken on 11 October 1970. 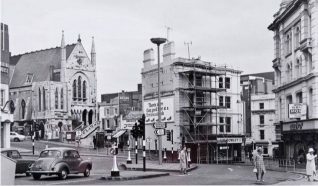 Although the picture shows other buildings, such as the Central Free Church, its purpose was to record 1 and 2, North Street Quadrant. These buildings were about to be removed and were demolished in February 1971. Photograph four: After the extensive widening of the period 1926/1936, the road remained virtually unchanged for 30 years. Then as part of the vast West Street redevelopment, all the shop buildings on the south side between Upper Russell Street and Clarence Street were demolished during 1967. Photograph five shows the last of the doomed buildings, 22-25 Western Road, with the hoarding around the cleared site of 26, the building at the corner of Clarence Street. Photograph six shows 16-22 Western Road. 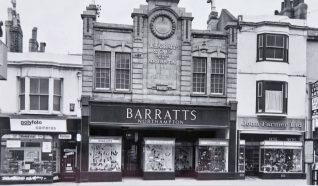 Unlike the others, Barretts was a comparatively modern building having replaced much older shops in 1923. 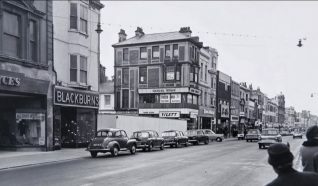 Do you remember Western Road at this time? 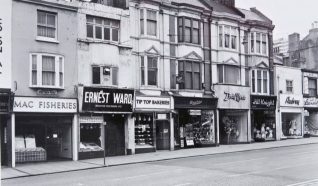 What about the shops – do you remember any of them. And what about prices at the time? If you can share your memories with us – please leave a comment below. Hi Jennifer, photo one is the eastern end of Western Road, not the western end. Also in photo three, I don’t think those buildings were demolished in 1971, I think it was much later, more like late 1990’s or even early 2000’s when they were replaced by the George shop! After Churchill Square was first built, a visit to the then vast Miss Selfridge was almost a day out, certainly a Saturday afternoon out. I bought a black pleated skirt in 1969 for £4/19s/11d, which I still have. I earnt £1 as a Saturday girl at Woolworth’s in St James’s Street at the time and the following year, I worked full-time at American Express for £9/4s/7d a week So that was an expensive skirt! I worked Saturdays and school holidays 1953 and 1954 at BHS. Very nice to have a little extra pocket money. I liked that store. Lots of interesting shops around. My shopping – mainly window shopping, in Western Road started at M&S and finished at Debenhams. Boots was in Western Road. Always busy. I think there was a Post Office counter at the back of Boots. The Regent dance hall and cinema were in North street. Although Churchill Square is sheltered from the weather and is easier for people to have their stores in one location I feel it is just not the same as wandering along one side of Western and back on the other side to catch a bus outside M&S. Waiting for the bus in wet and cold weather was a part of everyday life. I used to work in Lipton’s the grocers, where my uncle Tom was manager, about 1957, Western road, it was a great place to work and shop. We had a very good clientele, a large Jewish population and they were smashing people to serve. It was a good time for a young girl in her first job. Back in the 1950s we lived near Preston Park, so our daily shopping was in Preston Rd and London Rd, but on Saturday we took the 5/5b/15/19 bus to Western Rd. A real treat was having cheese on toast in what I think was the BHS store, that is now Primark. A wonder at that time was a supermarket or as my mother invariably called it the ‘help-your-own-self’. I think the Western Rd one was Fine fare. I worked in Woolworths in the mid ’60s and have been racking my brain to remember the two clothes shops that were opposite Woolworths. One I am sure was Dorothy Perkins and the other was Martin something. Anyone remember? The Kellys 1969 shows a ‘Martin Ford, ladies outfitters’ at 48 Western Rd. Martin Ford’s was a fantastic place to shop for a 15 year-old back in 1970. And it was cheap. I remember buying a rather diaphanous lacy blouse and black hot pants there. I thought I was the bees knees, but must have looked a sight. No wonder I hid my outfit from my dad. What is so fascinating about old photos like these is the possibility of recognising someone you once knew. Any one of these ladies could have been an aunt of mine. And the ‘Morri-Minors’ were a great favourite of ours. In the ’70’s my husband and I had two of them. A dark blue Minor for me and new baby and a pale blue Traveller for my husband’s work journey. Still love them nowadays. If my memory serves me well wasn’t there a Maynards sweet shop on the south side ( the Eastern end) of Western Rd? I have memories of walking back from St Paul’s School in the early 60s and going in that shop with my mother. The 1951 Kelly’s shows Maynard’s was at #57 near Clarence Gardens and Castle St. I remember working at Fine Fair Western Road on Saturdays and School holidays. I was part of the back room lads working on Fruit and Veg. Horrible jobs included sorting out the rotten tomatoes and potatoes and repackaging the rest. I never bought any food there! A vivid memory was sending packs of tomatoes down the grated lift called the Sovex. Nobody picked up on it when they were supposed to and the lot got squashed as the next grating followed! I was offered a trainee managers job but that was not my long term interest and turned it down. Sometimes going in on a Saturday could be interesting. If everybody was quiet and unresponsive it meant there had been a bust up with the F&V manager. I think Fine Fair later went out of business which was not surprising. I later, 1961, went to work at Mitre House for the Inland Revenue and after various promotions and moving around the south east and London, retired in 1998. Much more interesting than a supermarket. I have a very old photograph of a lady and child which was printed at 48 Western Road, Brighton, which is what lead me to research the history.